When you decide to buy a new TV, there are probably a couple of questions you ask yourself before diving into the purchase. Those questions probably include things like: Can I afford it and still be able to pay the bills? Which model will provide all the qualities I’m looking for? Is it a good value for the cost? Asking those questions can help you better determine whether you should make the purchase or not. Well, buying a house is a much bigger purchase, but those same questions apply. Granted, since it’s a much bigger purchase, buying a home comes with a few more questions you’ll need to answer before you dive into house hunting. One of the biggest and, arguably, most important questions is: How much house can I afford? Figuring out finances is a major part of buying a house because this is a decision that will affect you financially for years or even decades to come. In that sense, the question shouldn’t just be about how much of a mortgage you can get a bank to agree to loan you. The bigger question is how much can you feasibly stand to pay every month based on a combination of different factors. For example, a lender may be willing to approve you for $400,000 based on your credit score and how much of a down payment you have. With an $80,000 down payment (which is the full 20 percent), you’ll be looking at monthly payments at or above $2,000. If you aren’t prepared to offer a full 20 percent down payment, odds are good you’ll need to pay mortgage insurance as well. Not only will your monthly payments be higher with less money down, but you’ll have that additional expense of the mortgage insurance added to your monthly bill. When you look at the numbers individually, a $2,000 monthly mortgage payment may seem feasible. But when you add in utilities, credit card bills, and your other monthly expenses, that $2,000 a month payment can quickly become too much to pay. So, when we talk about how much mortgage you can afford, it’s important to remember that your mortgage payment should be a portion of your monthly bills, not just a standalone number. A lender may approve you for a higher loan amount, but it’s important to calculate everything, not just what you can afford based on your income. 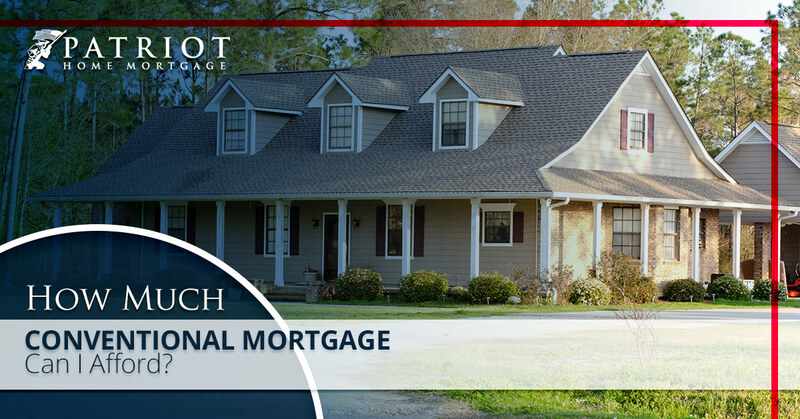 A conventional mortgage is, as the name implies, one of the most common types of loans you’ll come across. The name refers generally to any loan that isn’t backed by a government entity the way VA home loans or FHA mortgage loans are. Different lenders will have a variety of different qualifications, but most of those qualifications will meet or come close to the qualifications set forth by Freddie Mac and Fannie Mae — the conventional mortgages that meet those requirements are generally referred to as “conforming.” For the purposes of discussing how much home you can afford, we’re going to use conventional mortgage terms as our example. That being said, other loan types will offer different limits or benefits, so it’s generally a good idea to meet with a mortgage broker to discuss options as they pertain to your particular financial situation. In order to figure out how much loan you can really afford, there are several different factors to look at. Any mortgage financing lender is going to look at your debt-to-income ratio, your annual income, your credit score, and how much of a down payment you have. The combination of those factors helps the lender determine how much they can safely lend you and how likely you are to pay back the money they lend you. Those numbers are generally generated from underwriting software, which means they give the lender a pretty good idea of a pure numbers situation; however, that doesn’t take some of the more human elements of money matters into account. Other savings — are you planning to have a baby soon? Take a trip? When you’re determining how much house you can afford, it’s vital to think about your finances in a well-rounded manner. A lender may approve you for more of a loan than you’re actually prepared to pay for. Of course, just because you’re pre-approved for a certain amount doesn’t mean you have to use that full amount when you buy a home. If you want to buy a house but you’re not sure where to start, the best place can often be working with a mortgage broker. We can help you determine how much house you can afford based on what you have saved and what you want monthly payments to be. And, the best part about working with a mortgage broker is that we work with a variety of lenders so we can help you find the right loan, whether a conventional mortgage or another option is the best. Let the Patriot Home Mortgage team help. Give us a call today!